Lars Karlsson, MD of KGH Global Consulting, has been asked and has agreed to chair the Advisory Board of the International Border Management and Technologies Association (IBMATA). 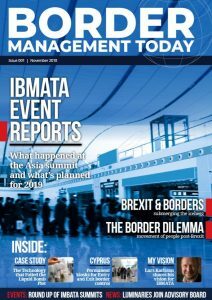 In the latest issue of Border Management Today magazine, Lars Karlsson presents his vision for the organization. In a comment Lars Karlsson states: “It is a great honour for me and KGH to be offered this position, and it also proves how our long track record of delivering smart, safe, fast and predictable border solutions has made an impact and an impression on the border community. IBMATA is an important platform institution for innovative approaches in relation to the global movement of people, and we know today that the movement of people and the movement of goods are very closely linked. This will be true even more so in the future. This is why IBMATA is needed and I will do my utmost to serve the organization to the best of my ability”.